WASHINGTON, D.C. - In honor of his unwavering commitment and support of the forthcoming National Coast Guard Museum, Donald T. “Boysie” Bollinger, renowned philanthropist and retired president and CEO of Bollinger Shipyards, will receive the 2017 Alexander Hamilton Award during the 2018 National Maritime Awards Dinner, April 25, in Washington, D.C. Joining Bollinger in being honored at the event will be J.W. Marriott Jr., executive chairman and chairman of the Board of Marriott International, Inc., and William C. Baker, president and CEO of the Chesapeake Bay Foundation. Established and presented by the National Coast Guard Museum Association (NCGMA), the Alexander Hamilton Award is an annual recognition bestowed upon an individual whose leadership, vision, volunteerism, and support has had the greatest positive impact on forwarding the goals of the National Coast Guard Museum initiative. The award is appropriately named in honor of Hamilton, who established the Revenue Cutter Service in 1790, a predecessor of the Coast Guard. Former recipients include James J. “Jimmy” Coleman Jr. (2015), current NCGMA Board chair and former chairman of International-Matex Tank Terminals, and J.D. Power (2016), founder of J.D. Power & Associates, who is Honorary Chair of the National Coast Guard Museum Campaign. Bollinger learned of his selection for the distinction at an unveiling event for the proposed National Coast Guard Museum World War II Gallery, which is being made possible by his $1 million gift to the Museum. 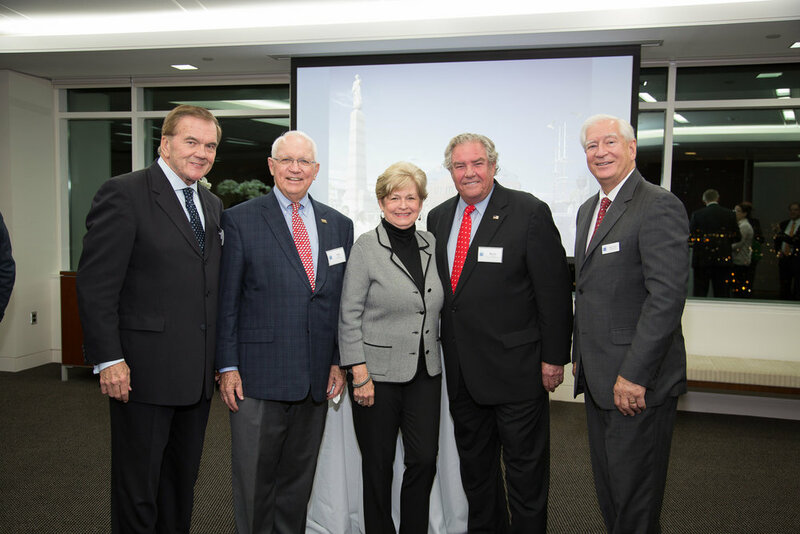 The November 2017 New Orleans event was jointly hosted by Secretary Tom Ridge, the first Secretary of the Department of Homeland Security, 43rd Governor of Pennsylvania, and co-chair of the NCGMA Secretaries Circle, and NCGMA Board Chair Coleman at the offices of Jones Walker. The gallery, to be named in Bollinger’s honor, will showcase the bravery of Coast Guard men and women during this period in American history. Coleman was joined at the announcement and unveiling event by Bill Hines, managing partner of Jones Walker, who also announced a contribution to the National Coast Guard Museum. Additionally, Admiral James Loy, 21st Commandant of the USCG (Ret. ), and other members of the NCGMA Board of Directors, including Susan J. Curtin, partner, Power Enterprises, and president of Kenrose Kitchen Table Foundation, were among those in attendance. Also at the event, the Coast Guard Heritage Museum shared a 1945 USPS commemorative stamp featuring the USS MIDDLETON in the background and two Higgins boats in the foreground. The stamp was first issued in the New York City on Nov. 10, 1945 to honor the contributions made by the U.S. Coast Guard during WWII. A native of Lockport, LA, and a graduate of the University of Louisiana at Lafayette, Bollinger has long been a champion for his community. In the aftermath of Hurricane Katrina, Bollinger worked with the Louisiana Recovery Authority and the Bring New Orleans Back Commission to help neighborhoods and businesses rebuild. He currently serves on several boards and actively participates in political arenas at both the national and state level. The NCGMA will educate the public about the evolution of the maritime and military history of the United States Coast Guard (USCG) and its contributions to America by designing, constructing, and developing programming for a museum. The Museum, currently in the schematic design phase, to be built along the historic waterfront of downtown New London, CT, will explore the USCG’s rich history, current impact on our nation and the world, and its future service through interactive exhibits, programs, public and private partnerships, and STEM-based, lifelong learning experiences. The NCGMA will achieve this through the When the Most is Expected capital campaign to raise $50 million or more from private sources and coordinate the use of $30 million in federal funding and $20 million in Connecticut state funding. Once established, the fully operational Museum will be gifted to the USCG.